Multiple landslides triggered by heavy rains have obstructed the roads and foot trails at Bulung settlement of Bigu Rural Municipality in Dolakha district. The settlement, which shares border with China, is cut off from rest of the district since Tuesday. Chief District Officer Sagarmani Pathak said there were reports about several people trapped or injured by landslides, but the rescue personnel could not reach them owing to road blocks. 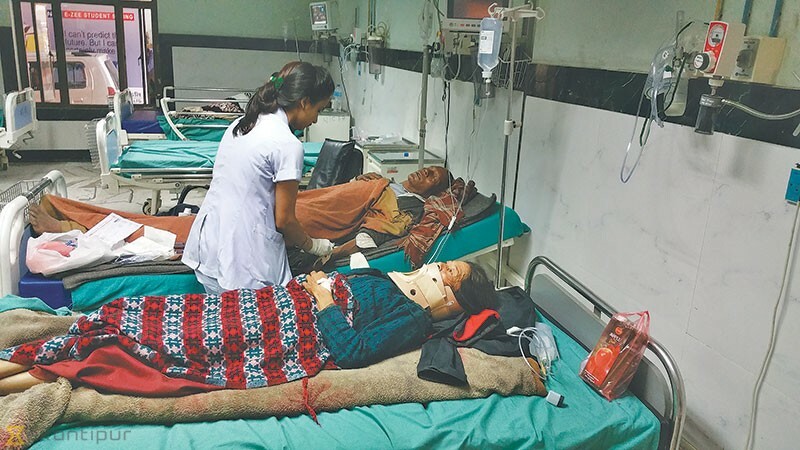 “Though a Nepal Army (NA) helicopter airlifted an injured couple from the landslide-affected area on Wednesday, there are still many people who are caught in the middle of the landslides,” he said, adding that rescue workers were making efforts to reach the village. The Tuesday’s landslides also damaged water pipelines, downed electricity poles and damaged at least a dozen homes. “More than 50 houses are in danger. We are trapped here,” said Hari Shrestha, a Bulung local. Similarly, a flood at Thado stream displaced 20 families in Bulung. Landslides and floods also affected scores of homes in neighbouring Laduk, Orang, Sarkigaun and Singati Bazaar. Singati Bazaar residents said the Sighati-Lamabagar road was shut as a result of flooding and landslides. Landslides caused by torrential rainfall also damaged several homes and a health post building at Gaurishankar Rural Municipality. In a separate incident, an 18-month-old baby was killed when a landslide buried a home at Mandandeupur in Kavre district on early Wednesday morning.